When Ger Loughnane was busy sculpting his Clare team from shivering big-day chokers into snarling hitmen, he consulted a number of sources to aid the transition. One was noted hurling journal, the Sloan Management Review, the MIT publication which "leads the discourse among academic researchers, business executives and other influential thought leaders about advances in management practice". One article was of particular interest. "By breaking the rules of the game and thinking of new ways to compete, a company can strategically redefine its business and catch its bigger competitors off guard. "The trick is not to play the game better than the competition but to develop and play an altogether different game." In broad strokes, the passage outlines why innovation in hurling has frequently come from outside the traditional powers. And when the traditional powers have been forced to innovate, it has usually come at a time when they had slipped behind the competition. Drawing too many big conclusions from this year's Allianz Hurling League is probably a mistake. According to the consensus, we have just sat through the most irrelevant league campaign of them all. John Meyler's cheerfully indifferent reaction to losing in Nowlan Park on the opening weekend set the tone for the entire campaign. He did not, it is fair to say, sound like a man on the brink of depression. The sponsors mightn't have been thrilled. With the system being changed next year and the demands of the new championship structure now clear to all, the presumption was that most counties were simply treading water, biding their time in order to peak for the summer. But tactical shifts have been detected. RTÉ hurling analyst Christy O'Connor observed this week that, following the scoring bonanzas in the championship in 2017 and 2018, many teams have taken a defensive turn this spring, directing their half-forward lines to retreat deeper and deeper in the hopes of dominating the middle third of the pitch. 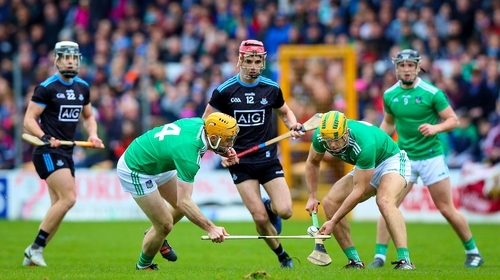 The Limerick-Dublin game set alarm bells ringing with the purists. The middle third, according to most accounts, was more congested that the M50 at rush hour. Unusually for a current inter-county manager, Eddie Brennan could keep quiet no more and gave full vent to his feelings on Twitter. "God this is ugly hurling, as near as it gets to all out defending which has destroyed Gaelic football," wrote Brennan. Turning into Gaelic football is always the appalling vista, though it was, and this should be recognised, a big concession from a hurling man to imply that Gaelic football was ever anything but destroyed. You actually have to go back to 2008 for the last time an inter-county Gaelic football match concluded without such a tweet being sent (stat may be open to correction). Hurling people could chortle at all this fretting but no more. The hurling equivalent, it transpires, is a picture of the middle third of the pitch with an absurd number of bodies clustered together, all rooting around for possession - before the ref intervenes and throws the ball in, often setting in motion the same process again. It is fitting perhaps then the league final has thrown up a match-up between two teams renowned as the most tactical around. And it highlights again, if it needed highlighting, that we are living through a revolutionary period in the sport. Tomorrow's combatants, Limerick and Waterford, the reigning All-Ireland champions and the All-Ireland finalists from the previous year, have won two All-Ireland titles between them in the last half-century. Both have endured long barren periods. Limerick, aside from an unlikely foray into the latter stages in 2007, achieved little or nothing at senior level for the most of the noughties. Waterford, while impressively consistent in the 21st century, were an irrelevance in the 80s and in most of the 90s, and still haven't won the big one since 1959. Perhaps it's their status as infrequent winners, living outside the aristocrats' tent, that means they're less welded to a 'traditional' style of play. Limerick are widely perceived as a highly defensive team who, this spring, have adopted a crisp, short-passing game a la Cork in the mid noughties. The gameplan's effectiveness was especially evident in their second half rout of Tipperary in the Gaelic Grounds in Round 2 of the league. Even their workhorse forwards, Gearoid Hegarty, Tom Morrissey et al, are expected to chip in with a couple of points per game. Waterford, by contrast, have loosened the defensive knot a bit this year, stationing more men in the forwards on a permanent basis. Their scoring stats have shot through the roof. But the Derek McGrath years should surely mean that they could fall back into a defensive shape should the situation demand it. By and large, it's Limerick and other teams' reaction to them that has dictated the tactical direction of this league campaign. Teams react to the All-Ireland champions by either copying their style or fixating about how best to counteract them with the tools at their own disposal. As O'Connor noted, "There are numerous strands to this debate but the dominant one is that the All-Ireland champions template is invariably copied the following season by most teams. "And the subtle style-change throughout this league has largely come from those teams plotting to try and beat Limerick. There has been a move to greater physical presence, and physicality, in the middle third." It's winners who set the agenda in hurling and tactics became very unfashionable in the Kilkenny era. During their long years of dominance, Brian Cody was keen to give off the impression that this tactics stuff was all quackery. Self-effacing to the point of parody, Cody seemed to imply that anyone with the remotest acquaintance with common sense could win with this team. Because Kilkenny were winning every year, it became in fashion to ape Cody's forbidding attitude towards tactical jiggery pokery. It was all just shortcuts to cover up for the fact that the real work hadn't been done. His tactical instructions could, at times, be rather gnomic. Mattie Kenny, whose Dublin team drew the ire of the purists last weekend, was a central figure in Galway's backroom team in their charge to the All-Ireland final in 2012. The westerners had stunned Kilkenny, and the hurling world generally, in that year's Leinster final, rattling them with their intensity but also befuddling them with a strategy which saw most of their forward line slip back and swamp the midfield on opposition puckouts. After the drawn final, the Kilkenny players and management, according to former goalkeeper David Herity, sat in conclave to discuss their response. For the players, it boiled down to a simple question. Should the backs follow their men out the pitch or should they hold their position and mark space? "Yeah, I think ye should", was Cody's response. The players left the meeting still looking at one another. It didn't seem to hinder them in the replay. The question of whether Kilkenny 'did' tactics remains a point of debate. The players still insist they didn't, beyond the odd commonsensical tweak here or there, the impetus for which, Herity says, came mostly from the players themselves. Either way, the macho 'win your own ball' gameplan is no longer in vogue. Tipperary, it's been argued, were suckered into adopting the Kilkenny template in latter years, without having the type of workhorse forwards capable of executing it. Kilkenny, with a different cast of players, no longer even play like Kilkenny anymore. It's Limerick and the other upstarts who are setting the pace at present. Rightly or wrongly, teams will fix their eyes on Limerick and devote themselves to apeing what works and studying the ways in which can scrape an edge on them. The All-Ireland champions, as usual, dictate the way the game is going. Limerick v Waterford live blog on RTÉ.ie and the RTÉ News Now App from 1.30pm on Sunday. Live radio commentary on Sunday Sport, Radio 1, from 2pm. Highlights on Allianz League Sunday on RTÉ2 and the RTÉ Player from 9.30pm.